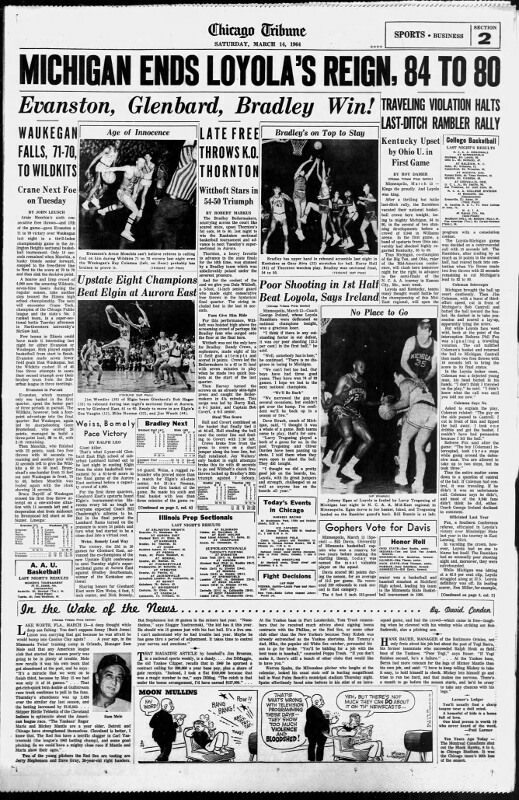 Defending Champion Loyola got knocked out of the 1964 NCAA Tournament by Michigan, led by Chicagoan and future NBA player Cazzie Russell. With the clock under a minute, Loyola's Jim Coleman stole the ball and was on his way to a breakaway layup to tie the game, but he was called for a travel. Michigan scored on the next play and won the game 84-80. The Wolverines went on to beat Ohio (who had knocked off Kentucky) for a trip to the Final Four. Loyola won third place in the Regional by beating Kentucky. Many people say it was not a travel, including some people who say the Ramblers (specifically Ron Miller) got away with a travel in the closing two minutes against Cincinnati in the 1963 final. And a postgame interview with the referee (was that common then?) had the ref who made the call, a referee who worked primarily in the SEC, avowing that "the boy" (referring to Coleman) traveled. This call, and what might have happened if the whistle never blew, was a major issue among a lot of the Loyola old-timers I talked to. Given the matchup coming up, it might be an interesting topic to investigate over the days leading up to the game. That IS for sure John !! That call is one of the little irems that have made me suspect the NCZZ !! I watched that Michigan game on tv. Jim Coleman did not travel. Kings die proudly. And Loyola was king. After a thrilling but futile last-ditch rally, the Ramblers vacated their national basketball crown here tonight, losing to mighty Michigan, 84 to 80, in the second of two stunning developments before a crowd of 9,948 in Williams arena. In the first game, a band of upstarts from Ohio University ha shocked highly regarded Kentucky, 85 to 69. Thus Michigan, co-champion of the Big Ten, and Ohio, ruler of the Mid-American conference, will clash here tomorrow night for the right to advance to the semi-finals of the NCAA tourney in Kansas City, Mo. next week. Loyola and Kentucky, teams many thought would battle for the championship of this MidEast regional, will open the program with a consolation contest. The Loyola-Michigan game was decided on a controversial call with 15 seconds left. The Ramblers, after trailing by as much as 10 points in the second half, had roared back into contention when Vic Rouse made two free throws with 22 seconds remaining to cut Michigan’s lead to 82 to 80. Michigan brought the ball up court cautiously. Then Jim Coleman, with a burst of third-effort speed, cut in front of Michigan’s Bob Cantrell and batted the ball toward the basket. He dashed in to take possession and scored a layup, apparently tying the score. But while Loyola fans went wild, back at the point of the interception Referee Phil Fox was signaling a traveling violation. The call nullified Coleman’s basket and returned the ball to Michigan. Cantrell then made two free throws with 10 seconds left to bring the score to its final status. Thus the entire matter came down to a question of control of the ball. If Coleman had control, it was traveling. If he didn’t it was an unfortunate call. Coleman says he didn’t, and most of the 9,948 fans didn’t think he did, either. Coach George Ireland declined to comment. Fox, a Southern Conference referee, officiated in Loyola’s victory over Mississippi State last year in the tourney in East Lansing, Mich. In vacating the crown, however, Loyola had no one to blame but itself. The Ramblers had an unusually poor shooting night and, moreover, they were outrebounded. While Michigan was hitting at a 43.8 per cent clip, Loyola struggled along at 37.5. Loyola definitely was off. Its leading scorer, Ron Miller, for example, could connect on only seven of 26 field goal attempts. Loyola surprised Michigan at the start by putting its shortest man, 5-10 John Egan, on 6-5 Cazzie Russell. Egan did a fine job, too. He held Cazzie to only four points in the first half. But after Loyola took an early lead, Michigan went to the front for good at 16 to 14 on a tip-in by Larry Tregoning with 14 minutes remaining in the first half. With their shots missing the mark, the Ramblers slowly fell farther in arrears. Bill Buntin [6-7], Tregoning [6-5], Oliver Darden [6-7] and Russell won the battle of the boards for Michigan. By winning this battle, the Wolverines eventually won the war. It was 43 to 36 at halftime and three times in the second period Michigan built 10-point leads. But Loyola was not ready to abdicate and midway in the last half it put on a full court press. Slowly it caught up. Another important point in its fruitless fight came when Coleman scored on a leaping drive-n. It cut Michigan’s lead to 76 to 74 with 2:52 left, but Coleman charged into Cantrell on the play and the latter’s free throw made it 77 to 74. Then Tregoning stole the ball from Hunter, and after taking a pass from Russell, scored on a lay-up. When Russell added two free throws, it was 81 to 74 with 1:30 left. Baskets by Rouse and Hunter and two free throws by Rouse narrowed the gap to 82 to 80. Then came that agonizing moment for Loyola fans when the tying basket was nullified by the traveling violation. Loyola was dead, but it went down like a champion. The most surprising thing about Ohio’s victory was the ease with which it handled the nation’s third-ranked team. The Southeastern conference kings never resembled a good team. Kentucky was outshot, outrebounded, outrun, and out hustled. The Wildcats never had so much as a tie, and indeed, after the earl moments, were never in serious contention. Cotton Nash, Kentucky’s celebrated All-American, best reflected his team’s ineptness. He scored only 10 points and his all-around play was weak. The pattern for the game was set early. Kentucky played a 1-3-1 zone defense but Ohio had a hot hand and zipped into a quick lead. The Wildcats, shooting poorly, got only one shot at the basket and then retreated on defense as Ohio dominated the boards. Even tho the Mid-American conference champions played the middle half of the game without Don Hilt, who sat on the bench with four fouls, they maintained a strong superiority over Kentucky. At halftime, Ohio had a 40 to 24 lead. We also played Michigan on Feb. 1, 1969 at Chicago Stadium and beat them 112-100. That Loyola 1968-69 team was led by Walter Robertson, younger brother of the Globetrotters' Pablo Robertson. Both Walter and Pablo played for DeWitt Clinton High School in the Bronx, Loyola, and the Globetrotters. I was sitting behind the Michigan basket with Coleman almost directly in front of me. I can still see the play. It was a travel in my brain before the whistle blew. I never thought it wasn't a travel and neither did anyone I was with. The Tribune I saw the next day was the Minneapolis Tribune, not Chicago, so this is the first time I had seen Roy Damer's article or Coleman's explanation. I am forced to admit that because of the angle I had I might have been unable to tell when he got possession. Hard to say you might have been wrong for 54 years, but it's possible as I'm finding out more and more frequently. I have a low opinion of Roy Damer. It wouldn't surprise me at all if he was wrong, and went with Coleman's denials just to pump a story. I'd be interested to see Bill Jauss' article in the Daily News to see if Damer was alone. Some of McCormick's personal crusades were seen as quixotic (such as his attempts to reform spelling of the English language) and were parodied in political cartoons in rival Frank Knox's Chicago Daily News. Knox's political cartoonists, including Cecil Jensen, derided McCormick as "Colonel McCosmic", a "pompous, paunchy, didactic individual with a bristling mustache and superlative ego." He was basically a younger, local Charles Foster Kane. Damer's columns were clearly biased in favor of Illinois in '63, so it wouldn't surprise me if he was against Michigan in '64. Col. McCormick's passions were not confined to the editorial section, and the policies on writing things the Colonel would have liked didn't change at the Tribune until the late 60s-early 70s. Sadly, Newspapers.com doesn't have the Daily News in the archives. Rhe Trib's Repub bias concerned me NOT one whit BUT their blatant bbacking of ND and the Big Ten rled me--Here we had a powerful LOYOLA--Strong in Both scholarly pursuits as well as HOOPS--AND they lierally ignored us--IN THE CITY mind you !! Always a disgrace--Damer was only one of many at that paper !! NOW FINALLY they are on the Bandwagon==But now that we are going up against a Big 10 team, I wonder ! !